Six in ten American adults (61%) get news online on a typical day, placing it third among the six major news platforms asked about in the survey, behind local television news and national or cable television news. While the internet is growing as a news platform, it has not displaced completely offline news sources for most American adults: A majority of Americans (59%) get news from a combination of online and offline sources on a typical day. 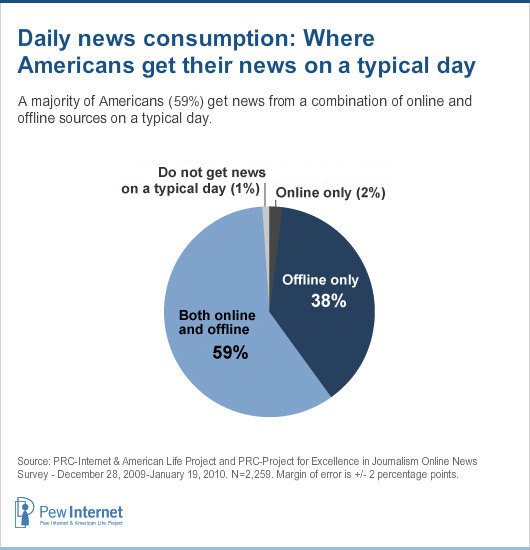 Just over a third (38%) rely solely on offline sources, while just 2% rely exclusively on the internet for their daily news. Asked more generally if they ever get news online, and if they ever get news online about 12 specific topics (such as weather, sports, national news, and business or finance), 71% of American adults say they get news online at least occasionally.3 This equates to 94% of all internet users. Who gets their news online? Online news users skew younger than the general adult population. About two-thirds of online news users (68%) are under age 50, including 29% who are under age 30. Given their younger age profile, it is not surprising that this group is also more likely than other Americans to have never been married (24% v. 9%) and/or to have young children (36% v. 17%). Online news users tend to be employed full-time (50%), two-thirds (67%) have at least some college education (including 22% with a bachelor’s degree and 15% with advanced degrees), and their annual household income trends higher than American adults in general. Racially, this group skews toward Hispanics and whites; while 50% of non-Hispanic African-Americans get their news entirely offline, the same is true of just 38% of non-Hispanic whites and 32% of Hispanics. Because they represent such a large segment of internet users, the demographic profile of online news users mirrors that of the online population as a whole, and it reflects the same characteristics that drive both broadband and wireless use. 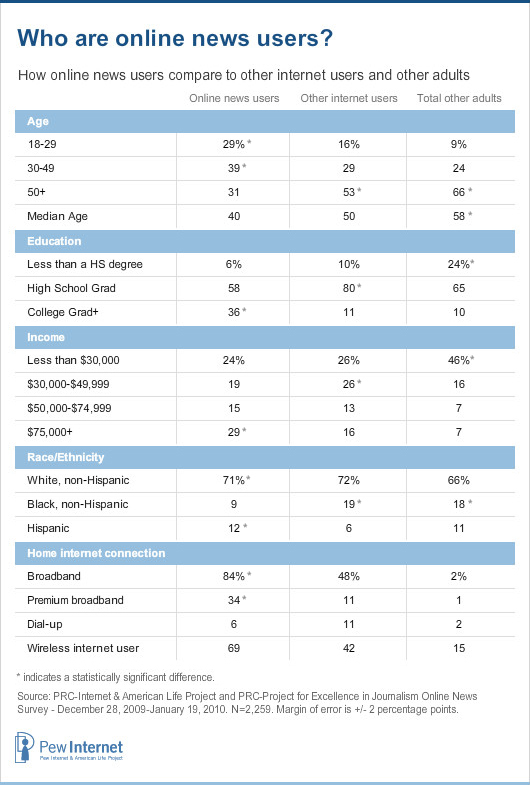 Yet even among internet users, those who get news online stand out in terms of their high income and education levels, their young age, their racial/ethnic identity, and their use of broadband and wireless (see table below). What news topics do people explore online? 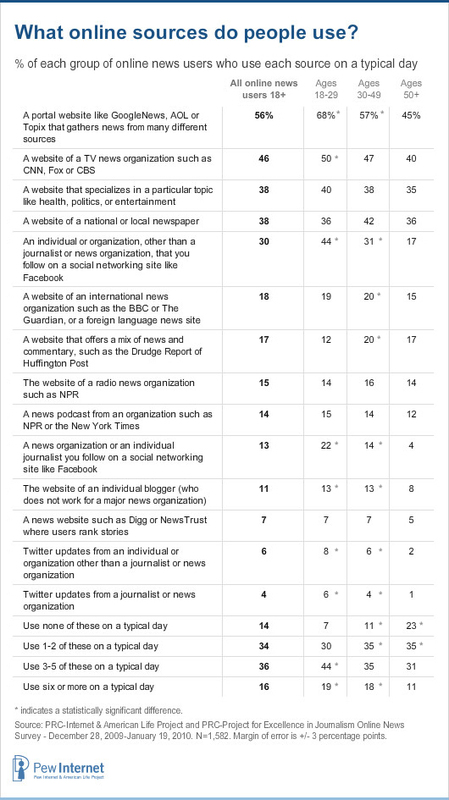 Internet users were asked how many, if any, of 12 specific news topics they explore online. Of those 12 news topics, the most popular are weather and national events. Overall, Americans explore a wide variety of news topics online. Four in ten internet users (40%) say they get news and information online about at least 9 of these 12 topics. In this report we sometimes call them “heavy online news users.” Another 39% explore 4 to 8 of these topics online. 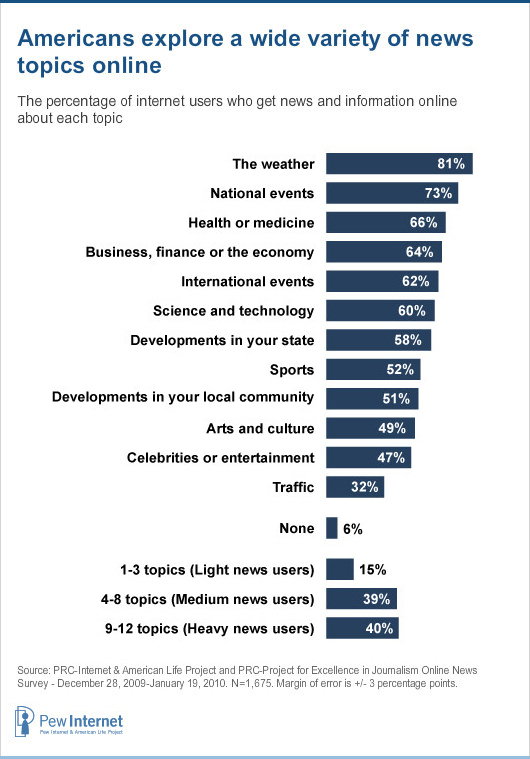 We call this group “medium online news users “ Some 15% get news on between 1 and 3 of these topics. We call them “light online news users.” Just 6% of online adults do not use the internet to gather information about any of these topics. While internet users who get news online tend to explore a wide variety of news topics, they are fairly modest in the number of internet sites they use to gather that information. One in five online news users (21%) say they routinely rely on just one website for their news and information, and another 57% rely on between two and five websites. Surprisingly, asked whether they have a favorite online news source, the majority of online news users (65%) say they do not. Among those who do, the most popular sites are those of major news organizations such as such as CNN and Fox. To get a sense of their daily online news consumption, we asked online news consumers if, on a typical day, they used a number of different online sources, ranging from the websites of major newspapers and TV news organizations to posts from journalists and news organizations on sites like Facebook and Twitter. Portal websites like GoogleNews, AOL and Topix are the most commonly used online news sources, visited by over half of online news users on a typical day. Also faring well are the sites of traditional news organizations with an offline presence, such as CNN, BBC and local or national newspapers. Twitter updates, either from either journalists and news organizations or from other individuals and organizations (including friends and family), were the least commonly used news sources of those asked about. The vast majority of online news users (84%) use five or fewer of the 14 news sources asked about on a typical day, including 14% who do not use any and another 34% who use just one or two. While overall, most individuals who get news online use just a handful of internet sources on a typical day, younger online news users tend to frequent more sites on a daily basis. The youngest online news users, those under age 30, are particularly likely to use portal news sites and to get news from journalists, news organizations, and others on Facebook. Online news users age 30-49 are more likely than both older and younger news users to make a daily visit to the website of a local or national newspaper or a website that offers a mix of news and commentary. In contrast, Republicans and those who describe themselves as conservative are more likely to make a daily visit to the website of a major TV news organization, and are also more likely than other online news users to utilize just 1-2 internet news sources on a typical day. Overall, a surprisingly small segment of online news users (35%) say they have a favorite internet news site. Men are slightly more likely than women (39% v. 30%) to have a favored site online, as are college grads when compared to other online news users (44% v. 29%) and those with incomes of at least $50,000 annually when compared with those earning less (39% v. 30%). The most active online news consumers—individuals who explore the greatest variety of topics online and those who use the greatest number of online sources on a typical day—are also more likely than other online news consumers to have a favorite site. Among those who have a favorite site, the most popular sites are those of major national television news organizations such as CNN and Fox, favored by more than a third of online news consumers who named a favorite site. Also popular are news aggregators such as Yahoo and MSN, indicating that many online news consumers like to get news about a variety of topics in one place. 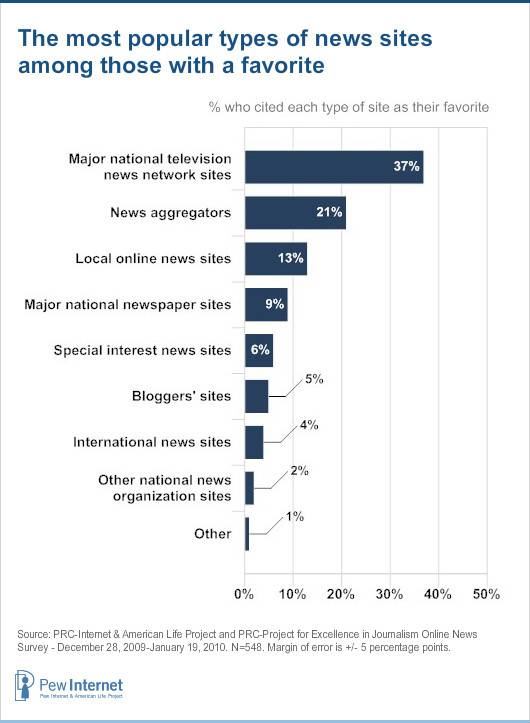 Still, among those who named a favorite online news source, 13% cited a local site, such as a local television station’s site, a local newspaper’s site, or a website or blog specifically developed to provide local news. One major concern about the internet is that people would use new technology to retreat into their narrow interests and that accidental news consumption—discovering things you didn’t know would interest you—would erode. This serendipitous news discovery, according to some scholars, is essential to forming public opinion and creating informed consensus and stable cohesion around public policy that makes governing possible. So, the prospect that technology might reduce the likelihood of that happening is a major civic concern. Go online specifically to get news? Come across news while they are online doing other things? The answers to these questions reveal that it is most common for online news users to chance upon news while they are online doing other things—what could be called “serendipitous” news consumption. Eight in ten online news users (80%) say this happens at least a few times a week, including 59% who say this happens everyday or almost everyday. Only slightly less common, however, is the hunting and gathering approach to online news consumption. About seven in ten online news users (71%) say they go online specifically to get news at least a few times a week, including almost half (48%) who say they do this everyday or almost everyday. Meanwhile, a smaller segment of online news users say that news finds them—44% get news forwarded to them through email, automatic updates and alerts, or posts on social networking sites at least a few times a week, which includes 28% who receive news everyday or almost everyday. One quarter of online news users (25%) say they never have news forwarded to them. Demographic groups who tend to be daily internet users—including younger adults, the more educated, those with higher incomes, and broadband and wireless users—report more frequent chance encounters with news as well as more frequent hunting and gathering experiences. The youngest adults (those under age 30) and cell phone users are most likely to have news forwarded to them. Getting “news on the go” via one’s cell phone, and the significance of receiving news alerts on one’s phone, is discussed in detail in Part 5 of this report.